The whole village knows. Yesterday at our friend Victoria's summer lunch party, the impending wedding of a Tayabali son danced from lip to lip like a happy cabbage butterfly drunk on nectar and petal. Everyone loves a good holiday chat, and who doesn't love a wedding when it isn't theirs to plan? I danced around, much like that butterfly, in startling green shoes, green hat and a mega watt smile, chirping and twittering and offering green guacamole on toast. When I tired, I snuck into the conservatory, and drank sweet tea under a bower of bougainvillea. Green and flowers are my battery chargers and I soon flitted out again. I am making place cards with dried flowers. I find myself greedily eyeing Other People's flowers and rather avariciously creeping my fingers towards said flowers before my mother smacks my fingers away. I am taking England with me - bluebells and daisies, forget-me-nots, primula, sage and lovage. I wish I could take the wisteria. 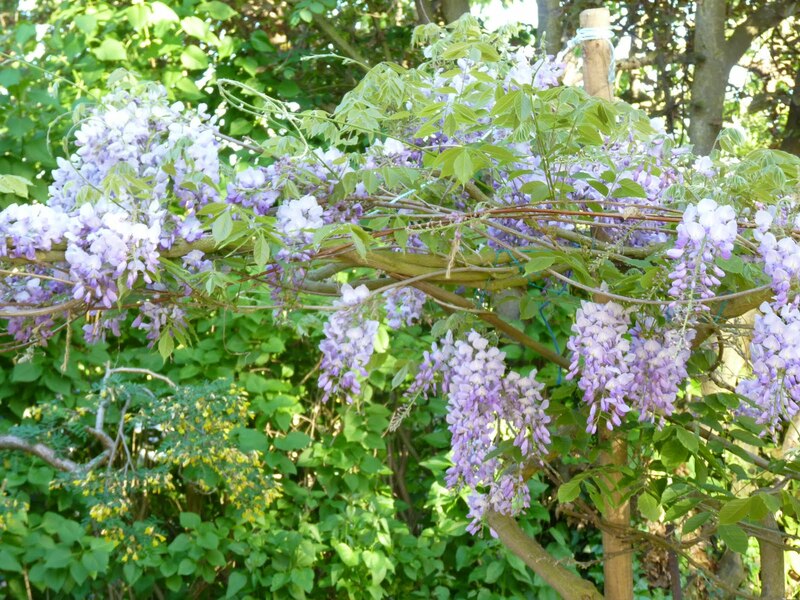 It has never looked lovelier, bloomier; thick with purple scent, dripping with promise, the wisteria is on the cusp of knowing. Down by the Vicarage, the wisteria are just as beautiful. It has been the home of my father's dear friend Ralph for many years. It boasts one of the most artistic and carefully tended gardens, and there Ralph decided to end his days. The cancer came fast and hit hard, and my father misses the aimless tuneful whistling that burst out of Ralph every time he left our house. "Goodbye, Cho!" he'd say to my father. "Goodbye kid!" he'd say to my mother. Weddings and whistlings goodbye. It is ever thus. This post is wonderful — writing suffused with the beauty of the flowers you describe, the butterfly you spy and the gardeners past and present whom you honor with this lovely and loving tribute. Sounds like you have a great plan for the place cards! First, I feel full of spring and joy because a) you posted and b) you are smiling, chirping and twittering! Last I heard from you, you did not sound that way. SO HAPPY I am. Second, and forever, yes, the post is wonderful. It put me right into a real or imagined set of an 18th or 19th century wedding a la Austen, with ebullient flowers, wicker chairs on the grass, tea . . . well all those things you wrote with love and beauty. And Ralph. Ralph is a gift. Good-bye kid. Ever thus. Have I missed your posts because I haven't seen you in such a long time. How delightful to see you again and I enjoyed the beauty of the garden and your descriptions of everything. I had a wonderful wedding on May 7th - my middle son - the first of three to marry! 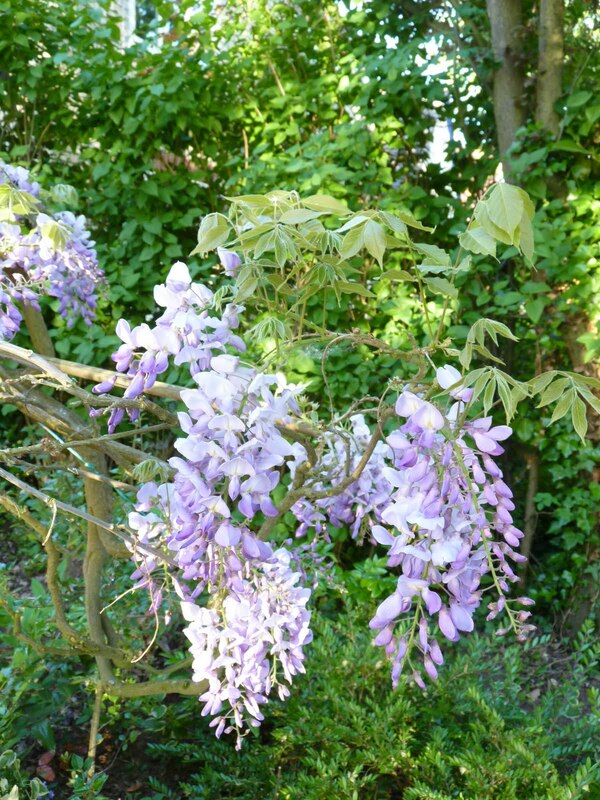 I do so love wisteria. There was a wonderful vine outside our CASARC offices at San Francisco General. For the 21 years I worked there before the budget cuts eliminated my forensic nursing position 15 months ago, I looked forward to spring and their short blooming time. Glad to see you happy and enjoying yourself. Hope this is a sign of things to come. Flowers always seem to make us smile. Weddings and Passings...milestones of the beloveds. Your Papa will miss Ralph and your whole family will be as changed by that event as they will be by the wedding. Here in Virginia where I have set up a temporary camp, preparing for my mother's funeral, I am now printing programs and cropping photos. And have brought my Mother's India here. Happy times! Enjoy the wedding. Hope to have a peek at your place cards. have a good time.may you be happy,always. I'm hoping you've got an Asian appetite with you for the food, and that the sun and humidity aren't tiring you too much out there, Shai! Can't wait to hear all about it when you've finished partying! Brilliant post, Shaista, your descriptions truly are magnificent. There is nothing grander than a delicate English summer, is there? The flowers are so timelessly beautiful.